This design is free from the Fairmount Fibers website. 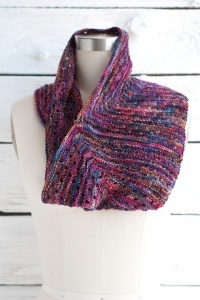 : This cowl is a playful exercise in mitering to make the most of a space-dyed yarn: the increasing number of stitches keeps the colors in the yarn moving along the row to avoid any striping or "stacking". A simple eyelet texture stitch draws attention to the change in knitting direction. Size US 6-24" circular needles, two stitch markers, and a spare needle for a 3-needle bind off are required but not included. Gauge: 20 sts and 44 rows over 4"